CoffeeRoaster Software is a dedicated software application for Coffee Roasting, Coffee Bagging, Green Bean Management and Coffee Inventory that has the ability to be driven by QuickBooks Sales Order or Invoice entries. 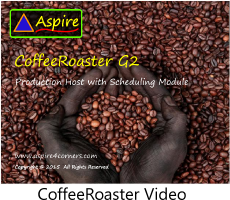 With optional Modules CoffeeRoaster Software provides the ability to provide Coffee Lot Management. The core CoffeeRoaster Software technology began in 4th Quarter 2008 at the request of a customer to organize Coffee Roasting and Coffee Bagging by leveraging the Sales data of QuickBooks. A solution was delivered 4th Qtr 2008 and Production began in Jan 2009. The initial version of CoffeeRoaster went through many improvements as it was better learned what the application needed to do to function effectively in a fast paced Sales/Production environment. From there it expanded with new customers having different needs. Over the years additional optional modules have been developed to provide Green Bean Management, Roast Logs by Lot and Single Origin, Coffee Roasting and Coffee Bagging, detailed data analysis and more. The additional optional modules include the Green Bean Module, Management Module, Roaster Module, Assemblies Module and the Scheduling Module. Each optional module has its own page within this web site. The initial CoffeeRoaster application, the CoffeeRoaster Production Module, manages Coffee Roasting, Coffee Bagging and finished\bagged Coffee Inventory. 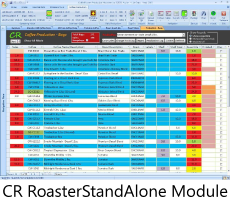 In 4th Quarter 2008 the original CoffeeRoaster software was designed using Microsoft SQL as the sales application through an ODBC connection, it was later modified to connect to QuickBooks Pro, Premier and Enterprise. Several years ago CoffeeRoaster added the capability of connecting to QuickBooks Online but this capability was not deployed as QuickBooks was in the process of extensive modifications and a complete re-write of QuickBooks Online. CoffeeRoaster retains the ability to be modified if needed to connected to the new version of QuickBooks Online, but as QuickBooks Online represents a small percentage of QuickBooks customers this capability will be deployed only if required by a customer. 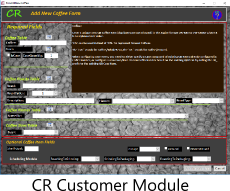 Additionally, it may be possible to modify CoffeeRoaster to connect to other Accounting Software depending on technical capabilities and costs. 2) How much to Roast? 4) How many to Bag? 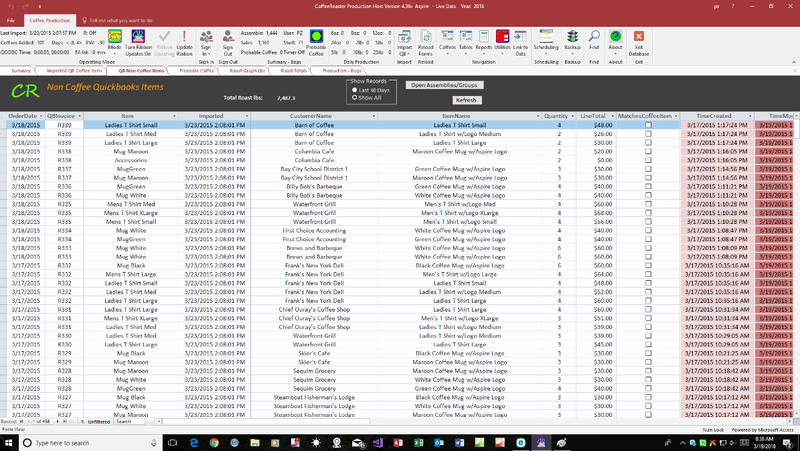 CoffeeRoaster stores configuration information for Roasts and Coffee Items and is able to translate the quantities sold in QuickBooks into answers to the questions above. 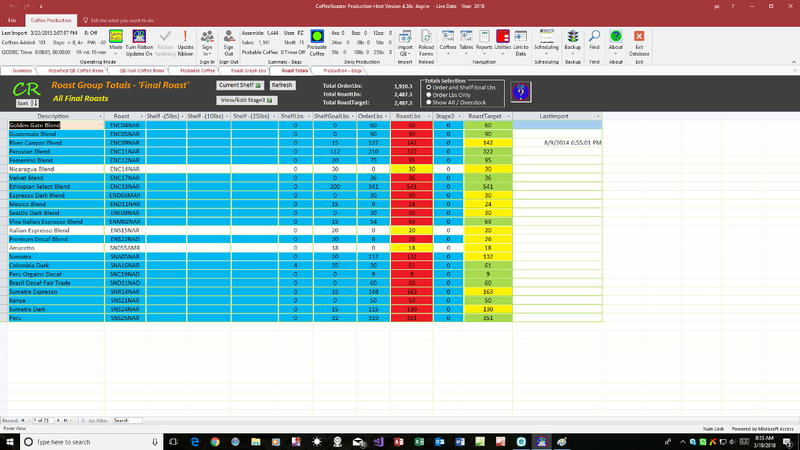 The form below shows 'What to Roast' and 'How Much to Roast' based on Sales Invoices and also based on optionally configured Shelf Goals. This form also shows both previously packaged 'Bulk' coffees (5 lb, 10 lb, 25lb bags) that may be used to fill orders for smaller bags and leftover roasted coffee from the previous production run (Stage3) that can be used to fill current orders. Once coffee is roasted it needs to be bagged for delivery to customers. The CoffeeRoaster Production - Bags form displayed below displays the number of Coffee Items that need to be bagged based on Sales Invoices, Shelf Goals and previous Production HIstory. 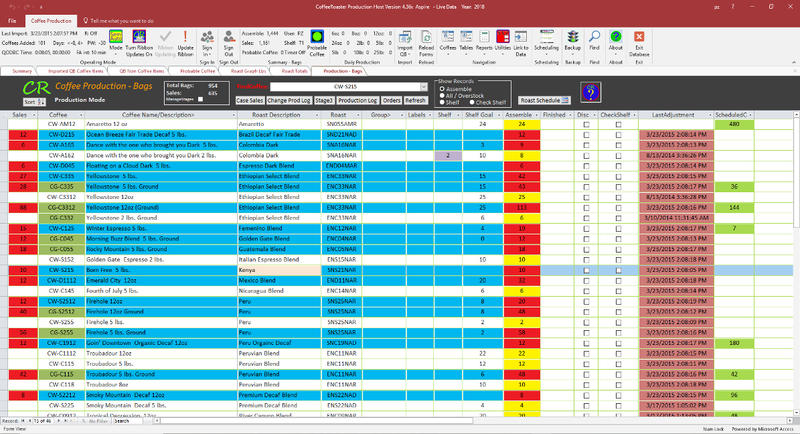 As you enter the quantities of 'Finished' items in the 'Finished' column, CoffeeRoaster logs your production data and it is available for CoffeeRoaster reports. In the form below, the red and blue rows represent items that need to be produced to fill orders. The olive Green fields inticate items that need to be Ground. As your production begins to fill orders the rows disappear from the form, if you bag more coffee than is required the excess is converted into a shelf inventory and will be utilized on the next sale. 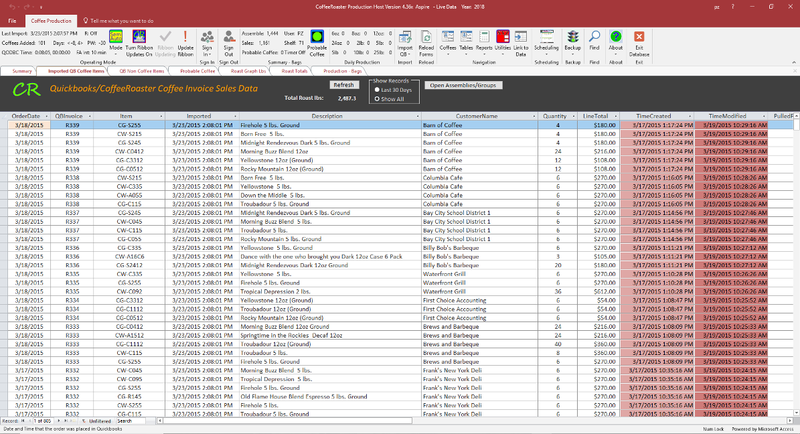 CoffeeRoaster connects to QuickBooks and other Sales data formats through an ODBC interface. For QuickBooks this interface is QODBC by FlexQuarters. The cost of QODBC for QuickBooks Pro and Premier users is about $150, for QuickBooks Enterprise users QODBC is already included. 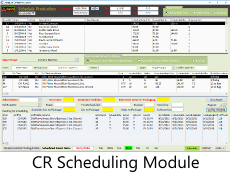 The form below displays imported QuickBooks Line Items which have been identified as Coffees and have been added to the CoffeeRoaster Production - Bags form. Your QuickBooks data may also include non Coffee Items, these items are displayed below in a QuickBooks Non Coffee form. 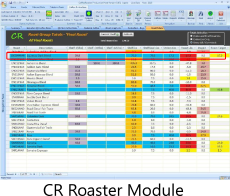 All QuickBooks Line Items whether Coffees or non Coffees are represented in CoffeeRoaster. 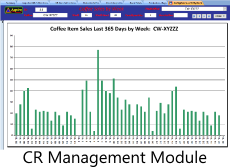 CoffeeRoaster supports both Private Labeling and Case sales in QuickBooks. Detailed Reports from optional Roasting and Green Bean Management Modules provide the necessary information for compliance with Organic Certifications. CoffeeRoaster Software is designed to work in a modern multiuser/multicomputer Microsoft Windows network. The image below shows multiple computers and CoffeeRoaster and QuickBooks roles.